Some weeks ago Pixeloo did his great untoonings of Mario and Homer. This inspired me to try something similar. Like Pixeloo I also wanted to use Photoshop. But I didn’t wanted to use any Photos. I just wanted to paint the whole thing. In Addition I not just wanted to lay a realistic texture over the original figure, but to rework the forms and proportions as well, to get the whole creature a more realistic look. This isn’t a untooning of bowser, it’s a redesign. How would he look like if he would be a real animal. While I changed some of his proportions here and there I still wanted to keep his overall character. 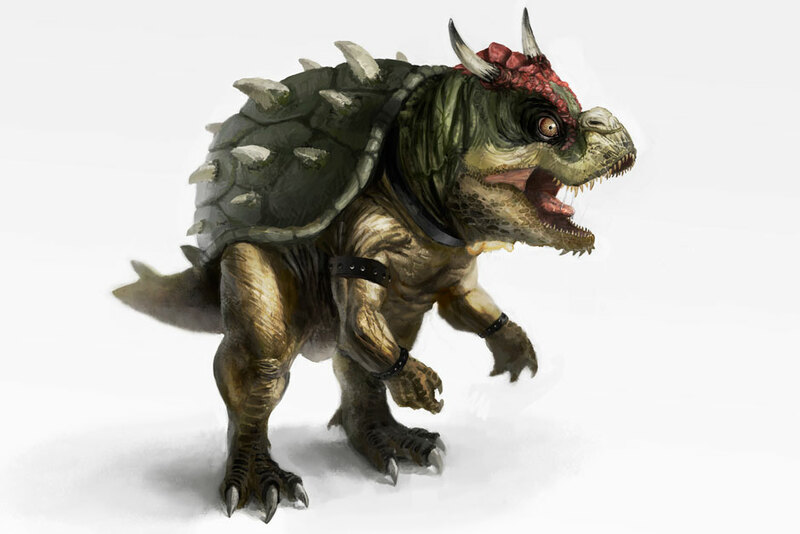 My redesign is a bowser who is a bit more slender with a narrower mouth that resembles a dinosaur. All this to give him a more realistic, faster and threatening look. I also took the original color scheme of Bowser and tried to convert it into some kind of realistic animal coloration. For this picture I only used the Photoshop Brushtool (99% a simple round brush) and sometimes the smudge tool. I never used more than two layers at once, trying to work much like painting as possible. My name ist Marcus Blättermann. Don’t forget to subscribe to my RSS-Feed and follow me on Twitter. You should also check out my Portfolio.